The Optimized for Outdoors family of rugged products are designed to withstand the rigors of the outdoors, while providing exceptional performance and durability. BoomBottle H2O+ is remarkably sturdy and durable - even in the harshest environments. It has an IP67 waterproof and dustproof rating so you can drop it, get it dirty and then dunk it in water to wash it off! Perfect for the beach, biking on dusty trails, lounging poolside, boating and more! And don’t worry about dropping it in the pool, lake or river – it floats for easy retrieval! True stereo sound is just seconds away when you take two H2O+ speakers and dual pair them. One will then act as the left channel and the other as the right. Open the back cover and use the pairing button to pair up your H2O+'s. 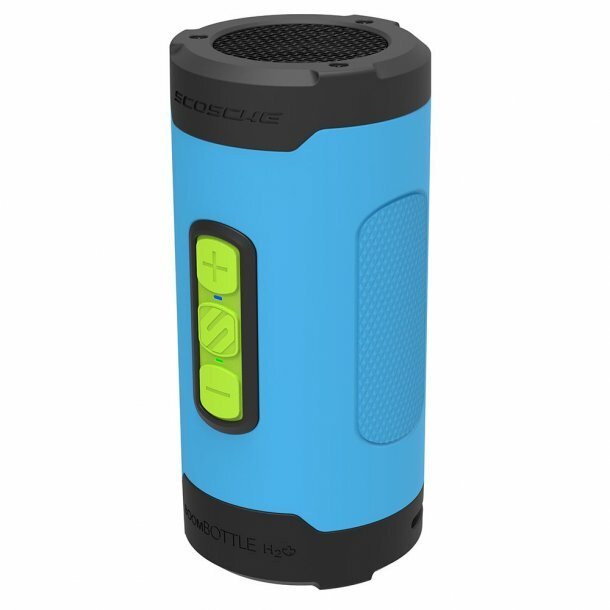 This waterproof speaker features Scosche's original bottle design ensuring that it will fit perfectly into bike water bottle cages so you can take it with you while on the trail. It fits just as well in cup holders so you can use it with your cooler, camping chair and more! Your BoomBottle H2O+ purchase includes a handy carabiner clip, great for hooking your speaker to a backpack. Don't forget to pick up a Scosche SuperCube 12W USB wall charger to provide the fastest possible charge to this waterproof speaker.